Hi everyone! I hope you are all well, I have been so very quiet this week because my family has been very very ill and it has knocked me about for all my commitments so any work I have been doing, I was unable to share just yet. I did quickly get this layout completed for the current Feeling Sketchy Sketch #71 Challenge as well as the ScrapFriends Colour #17 Challenge. Here is my take on these 2 challenges combined. 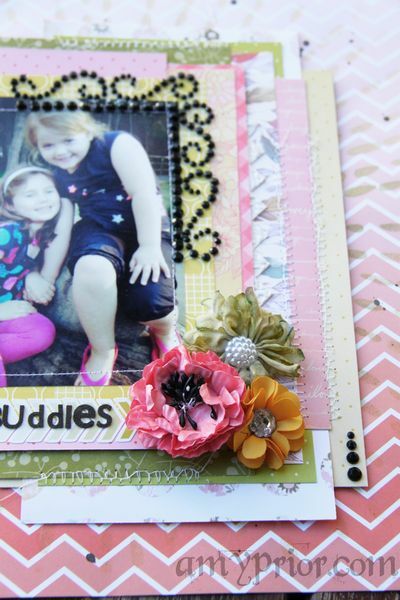 I have simply titled this layout “Buddies” because I was really struggling to label the photograph as anything other than a celebration of good buddies. 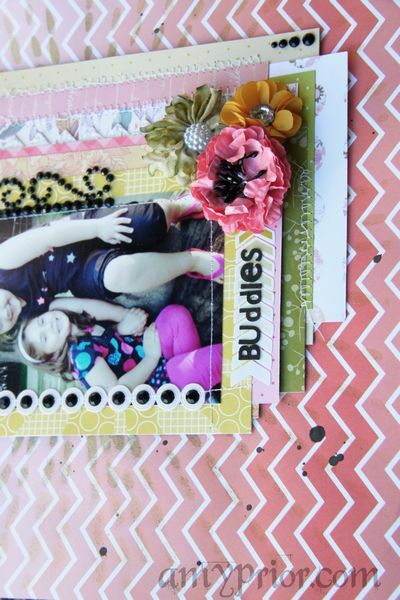 The papers that I have used for this collection are mainly from the Studio Calico Sundrifter Collection but I have added some random papers from Heidi Swapp and My Minds Eye into the mix as well. 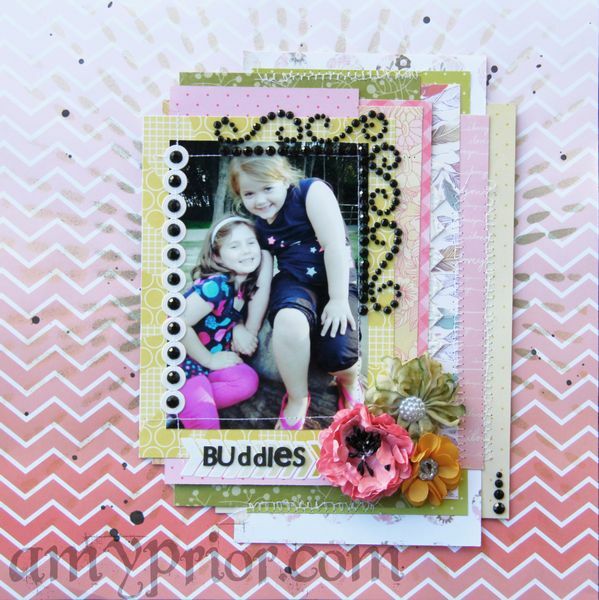 The background paper has been misted using a 12×12 Crafters Workshop Template with Heidi Swapp Color Shine Mists in Black, Chartreuse & Mustard. 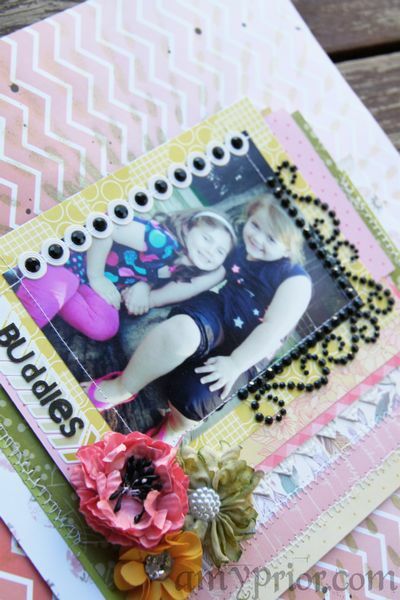 I am loving the Pink Paislee Artisan Elements lately and honestly don’t think I will ever get sick of using them they are just so fun to add to any project and so easily alterable. I have left them plain white for this layout and added some Black Flourish with a Bling Rhinestones to the centres of the circles on the circle border strip. The watermelon coloured flower is from Manor House Creations and just worked perfectly with my subtle hints of black for this layout. The other 2 flowers are from Flourish with a Bling and include 1 White Maddison Flower that I have coloured using Heidi Swapp Chartreuse Color Shine Mist and then heat dried until it melted a little. The other flower is a gorgeous little Elise Flower that I have left unaltered. The last touch was adding some Machine stitching and some black Heidi Swapp Color Shine Drops. My sewing machine was not playing nice and all my zig zag stitching was disastrous but still I love the messy effect of it. Well that is it from me for today, but check back soon for some more inspiration and until then, happy scrapping!